At Barger-Mattson we offer full service parts sales lead by a team of used auto parts experts. Our knowledgeable sales staff will guide you to the best prices on the correct replacement parts for your car, truck, van or SUV foreign or domestic. Our full service parts are dismantled, quality checked and ready for fast pick-up, delivery or shipping nationwide! We also offer access to a wide selection of new aftermarket replacement parts, nationwide parts locating service along with great standard and extended warranties. Are you a local automotive professional or do-it-yourself mechanic with the time and desire to find and dismantle your own used auto parts? Want to find large savings and discounts on used parts for your vehicle? 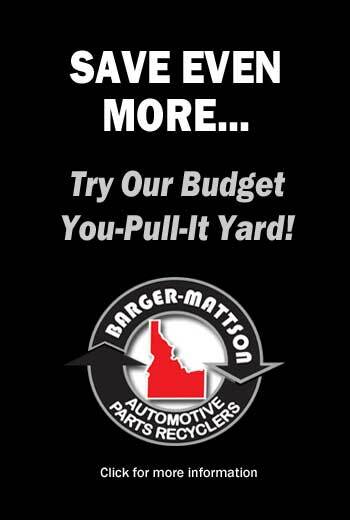 Well, Barger-Mattson’s Budget You-Pull-It Parts Yard might just seem like car parts heaven to you! With over 10 acres of parts vehicles including a wide range of year, make and models to pull your parts from, chances are high that you will find the part you need and save some cash! Searching for local wrecked, salvage or unwanted car buyers in Idaho? Want to get the best prices when you sell a salvage or junk car? Barger-Mattson buys all types of wrecked, salvage, junk or unwanted cars, trucks, vans and SUVs for parting out and recycling. We make it easy to sell a junk car in Twin Falls Idaho area! The Barger-Mattson name has been synonymous with quality used parts and outstanding customer service since 1962! Located in Twin Falls, Idaho Barger-Mattson is Idaho’s largest used auto parts recycler incorporating over 30 acres of auto recycling facilities, hundreds of parts vehicles as well as thousands of warehoused auto parts that have been quality tested and ready for delivery or shipment. Our sales staff members are all used auto parts experts and each one is dedicated to helping you find the best parts available for your car, truck, van or SUV. Call Barger-Mattson today and get a great deal on your recycled auto parts. Remember… “All Cars Run on Used Parts”! Searching for low mileage engines, transmissions, rear ends and other mechanical parts? Looking for “Insurance Quality” auto body parts in the Idaho area? Barger Mattson has acres of high quality parts vehicles as well as thousands of warehoused used parts for both foreign and domestic vehicles. Our in-stock parts have great warranties so you can buy with confidence knowing your parts purchase is backed by the Barger-Mattson name. Shopping for new aftermarket replacement parts and accessories? For some hard to find auto parts and accessories, buying new might make more sense than buying used parts. Barger-Mattson offers access to a wide range of new aftermarket auto and truck parts including many makes and models. You get the same Barger-Mattson expert sales and support as with our used parts. Call us today for parts prices and availability. At Barger-Mattson we understand that you need replacement parts for your car, truck, van or SUV ASAP! That is why we offer elite used auto parts sales and shipping service to all of Idaho, Nevada, Utah and the entire US! With our nationwide shipping services, you can consider us your local auto salvage yard no matter where you order from within the US! Call today for shipping and parts prices. Barger-Mattson is a full service auto salvage yard and used auto parts recycler. Offering some of the best prices on used auto parts in Idaho and the US, Barger-Mattson spans over 30 acres and is the largest used auto parts recycler in Idaho. BM offers thousands of in-stock parts for your car, truck, van and SUV including: engines, transmissions, rear ends, axles, transfer cases, suspension parts, wheels and tires as well as used auto body parts such as: bumpers, doors, hoods, grilles, fenders, doors, deck lids, complete front ends, quarter and rear body panels, lamps, headlights, taillights and glasses. We offer interior parts including; seats, radios, CD players, air bags, air bag modules and more. Other BM services include; budget pull your own auto parts yard, new aftermarket parts sales, local wrecked, salvage, junk and unwanted car buying as well as nationwide parts locating service, nationwide shipping and more. Barger-Mattson serves local cities and geographical areas including: Idaho, Twin Falls, Boise, Pocatello, Jerome, Burley, Rupert, Hailey, Mountain Home, Chubbuck, Blackfoot, Garden City, Kuna, Meridian, Eagle, Nampa, Utah, Ogden, Salt Lake City, Nevada, Oregon, Wyoming, Montana and entire US via nationwide shipping.